A niche restaurant able to cater for a various range of ages. Token, located in the heart of the revamped Smithfield, is one of many restaurants that attributes to its new trendy reputation. Smithfield is very accessible with the Luas stop just outside, however it is a good distance up the quays from the heart of the city centre. The building itself could be mistaken for nothing extraordinary with a slightly strange all-black exterior but it has enough visitors to be distinguished easily enough. Smithfield as a location for a new, retro restaurant was daring as it is a space in Dublin regarded as the core location for the courts of Dublin and in the past had a slightly rough reputation. This said, it successfully captivated attention using its other features, utilising social media in order to achieve popularity. 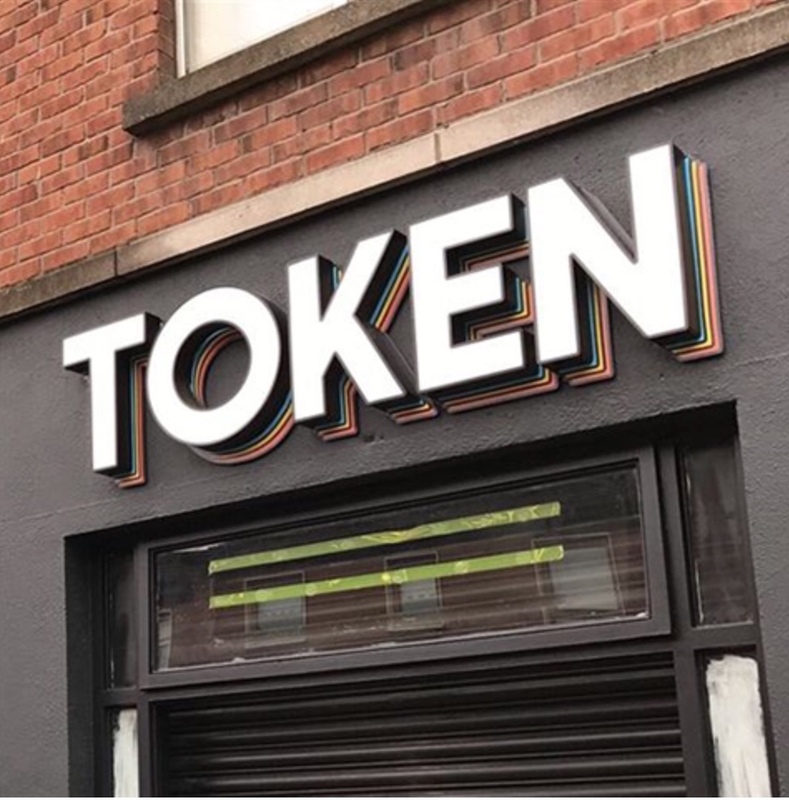 I had heard 100% positive feedback about Token since it opened last year encouraging me to go and experience it myself. As a kid, I had grown up playing the iconic games like; Rayman and Pinball on the ancient, chunky computer and during adolescence enjoyed playing Xbox 360 and my beloved Nintendo so I set the bar high for Token and it delivered. Token is an innovative form of restaurant bringing together food, a bar and some nostalgic fun. The set up as you enter are arranged as rows of vintage, classic arcade games such as; Street Fighter, Pacman and Mario Cart. Downstairs you can find additional seating and the widely cherished pinball machines. The layout works well as you can witness everyone playing the games while you enjoy food and a drink, however it can be noted that there is a slightly cramped atmosphere especially when it gets busy with everyone shuffling around. At times I found it near impossible to migrate to different games while holding a drink. The bar itself is accessible, central to the venue upstairs and prices of drink were surprisingly good. There is also a smoking area located just outside the entrance with some seating. Although categorised as a restaurant, the venue itself does not contain a lot of tables and this kind of gave me an impression that it would have been better to have eaten somewhere else and arrive solely for the gaming. Disregarding the entire fun fair environment, and the lack of tables, the food alone speaks for the restaurant and would allow someone to sacrifice their personal space whilst eating. The menu itself attributes to the fun, presented as an old, colourful magazine. The simple recipes such as burgers, chicken tenders and hot dogs place the American style menu on the pedestal of the Token. This said, there were plenty of vegan and vegetarian alternatives that our waitress had said she herself preferred over the other meat options. The food was delicious and integrated well with the entertainment. There is a neat offer where you can purchase your meal with tokens for the machines. It worked out about €20 for 20 tokens a meal, a side with a drink. I thought this deal with the tokens was great value for money, the only thing I would note is that the machines eat up tokens very quickly with most games taking 2 for a 1-person game and 4 to play with another. Tokens individually cost 50c and you can buy bags: 10 for €5, 22 for €10 or 50 for €20. You get an adorable keepsake bag to keep your tokens in. There are also only 2 token dispensers so when it is busy expect to wait in a queue for them. The staff could not be friendlier and more welcoming. The waitress who served us gave helpful advice on what to order on the menu. I felt there was enough staff to cater for the large number of people and they contributed to the fun environment fortifying the laid back, trendy impression. We had booked a table in advance which was a good idea as there were others waiting when we arrived for our table (Friday evening), you can book easily on their website. Lockers are provided as you enter to hold bags which made life just that little bit easier and cost €3. Token encourages a very social ambience creating opportunity to form new friendships. The overall aura is not distinct groups of friends but approachable people there willing to connect with others. Due to the space confinement, the whole experience is intimate so naturally, you are going to talk to someone you did not attend Token with. This is where Token differentiates from other restaurants as there is no definite privacy border, people watch others playing as they wait their turn enabling conversations with strangers. Despite this, it could be suggested as a really enjoyable outgoing for stags, hen parties or corporate night outs.